Check out this great design from Brunswick. 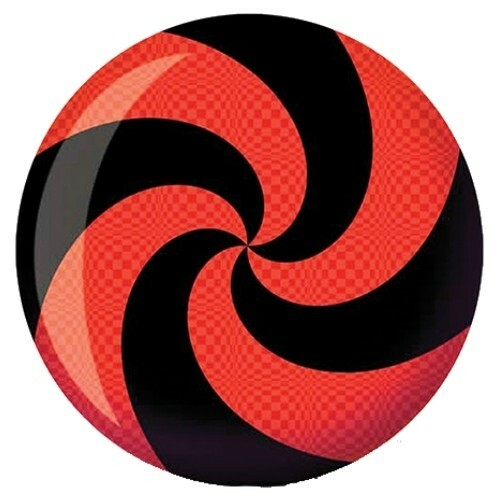 It has a Red and Black spiral design, but there is a cool checkered design within the red color. Don't miss the details on the Spiral Red/Black Glow Viz-A-Ball. The ball gets even better when the lights go out! It glows under blacklight! Product was in good condition and delivered on time. Unfortunately the ball looked more pink and purple rather than red and black. Gave it to my mom. She loves it!! I needed a heavier plastic ball, and this was my 1st choice. Love the colors and the way it looks going down the lanes!! Your driller can more than likely drill your name onto your ball. Does this come in black and lime green? Unfortunately, these balls will only come in the color that is advertised. will it come without the holes drilled? Due to the time it takes to produce the Brunswick Spiral Red/Black Glow Viz-A-Ball ball it will ship in immediately. We cannot ship this ball outside the United States.